iCarbons Skins for the iPhone 4 | Johns iPhone | iPhone Blog with Help, News, Tutorials, Tricks, Tips, and More! If you guys have kept in the last couple days on JohnsiPhone.com, we are currently holding a giveaway for the iCarbons on the junoyeopTV and JohnsiPhone1 channel. The iCarbons is a carbon-fiber like skin that iCarbons makes for the iPhone 3G, iPhone 4, iPad, and iPod Touch. They are made out of 3M tape, that you can reuse over and over again. The iPhone 4 skins come in both black and white. You have the option of having the Apple logo showing or covered up. If you choose to get the option with the log showing, you get a contrasting Apple logo, which has great contrast. 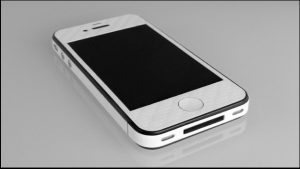 You can also get the bumper option, which can make the aluminum bezel white or black. I was skeptical at first, but it looks gorgeous on the phone. You can also choose to have the SIM card tray open or closed. If you are one of the people who wanted to get the white iPhone 4, the iCarbons is a the go to way for people on a budget. The iCarbons gives the appearance of having the elusive iPhone 4. The cutouts for the camera, proximity sensor and speakers fit perfectly. Some of the downsides of the skin is the home button that comes with the phone. It covers the signature home button without a replacement “square” on the button skin. It is also somewhat difficult to apply with a screen protector like a ZAGG on, however if you do the application process perfectly, which takes about 5 minutes, it is a breeze. Remember to check out the JunoyeopTV and JohnsiPhone channels to join the giveaway! I wish I could have one like that. I am a iPhone 4 collector.